For the past several days leading up to and following the release of For Colored Girls, the African American blogosphere has been set aflame with dozens of diatribes regarding Tyler Perry, the film, stories that are told from a female point-of-view, and relationships between 'colored' men and women in general. From the looks of things, a whole lot of people are upset with Mr. Perry for portraying the victimization of women and 'demonizing' Black men in the process (again). I must admit that the male images in the movie were less than honorable, with the exception of the character portrayed by actor/author Hill Harper , which was not a part of the original choreopoem by Ntozake Shange. We all understand that no individual is a one-dimensional being, so I'm sure that Tyler could have made the men appear more human by adding depth to their roles, but the story was not about them, it was about the women who had to learn how to press past their pain and move forward with their lives. Quite honestly, I don't believe that any intelligent person would take the negative images in that film and apply them to ALL African American men. That's just ludicrous. Like many of you, I was anxiously awaiting the release of Tyler Perry's latest film, 'For Colored Girls,' with bated breath. 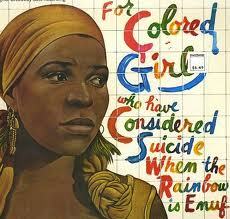 Although Ntozake Shange's original choreopoem 'For Colored Girls Who Have Considered Suicide When The Rainbow Is Enuf ,' was published in 1974 and had been performed both on and off Broadway, I did not become familiar with the work until I took a course in women's literature in college (in 1984). What intrigued me most about the story was the strength and courage of the 'colored girls' featured in the play; ladies who danced across the stage adorned in yellow, red, blue, green, brown, white, and purple. These women had spent time in Sorrow's Kitchen, licked out all of the pots, and lived to tell it! Each sistah's present life had been formed through the pain of her past, yet she still had hope for the future, in spite of the racism, sexism and classism that she faced on a daily basis. Christians, Please Don't Drink the Kool-Aid, Reach for the Living Water!! Over the past few weeks, there has been a tremendous amount of press regarding Atlanta's internationally-renowned pastor and businessman, Bishop Eddie Long. As we already know, five separate lawsuits have been brought against him (four which allege sexual misconduct and the fifth regarding default on a property loan). And to add insult to injury, a sexual harassment suit has been filed by a former employee of the church, holding the church 'culpable for sexual harassment, retaliation, breach of fiduciary duty and infliction of emotional distress'. News reports further assert that New Birth may have to file bankruptcy in order to settle the pending disputes. While none of these cases have made it into a court of law as of yet, they are currently being tried in the court of public opinion, in which people are generally considered guilty until proven innocent. Before I go any further, I must say that I pray that the allegations against Bishop Long turn out to be false. Over the years, I have followed his ministry on TBN and, for the past year or so, I have been a regular participant in New Birth's Sunday morning services, via the Internet. I partnered with the ministry and had plans to visit the sanctuary on my next trip to the ATL. With that being said, I must admit that I am deeply troubled by the things that have been reported about Bishop Long and New Birth. A couple of days ago, I was talking to one of my fellow sisters in singlehood and she was filling me in on the latest and greatest happenings in her dating life. We laughed as we talked about the challenges that we sometimes face in looking for a 'real love ,' or that someone who will love us for who we are and not what they think we bring to the table (cue Lisa Lisa and Full Force or Heavy D ). Just last week, while looking for a few music videos by Stephanie Mills , I ran across a long-forgotten, late 1980's remake of Roberta Flack and Donny Hathaway's 1972 hit, 'Where Is The Love?,' featuring the diminutive Ms. Mills and the late Robert Brookins. Hearing that song brought back a lot of memories of the good ol' days when music was more about relationships than 'relations,' but if you really pay attention to the words in the song, it is really about two people who have a desire to be together, but are entangled in other situations.